A South Korean baseball club owner has been questioned in connection with a money scandal involving a retired umpire, a source said Wednesday. The Seoul Central District Prosecutors' Office recently summoned Lee Chang-suk, the owner and former CEO of the Nexen Heroes in the Korea Baseball Organization, to investigate his connection with a former umpire surnamed Choi, who had allegedly contacted multiple team officials for quick cash, according to the source. Also on Wednesday, prosecutors said they have obtained circumstantial evidence that another KBO club, the Samsung Lions, also paid Choi. The latest development brings the number of embroiled KBO clubs to four, with the Doosan Bears and the Kia Tigers have already been implicated. On Tuesday, the Tigers admitted that two of their employees each wired 1 million won ($890) to Choi in 2012 and 2013. 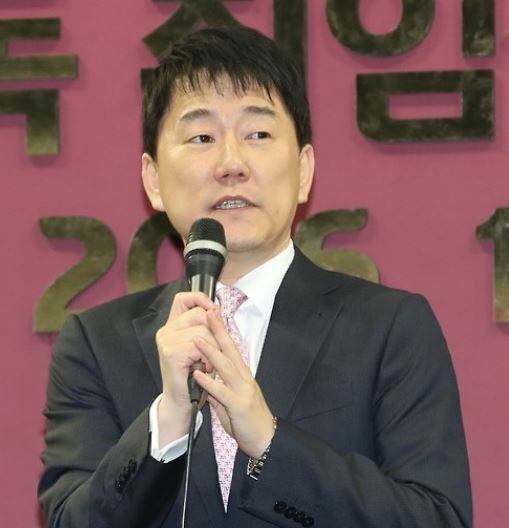 In July, Doosan Bears President Kim Seung-young resigned after admitting to having given 3 million won to Choi in October 2013. Any financial transactions between umpires and club employees are strictly prohibited. Choi retired from umpiring in 2014. According to the source, Lee was grilled by the prosecutors on Tuesday and was questioned whether there was a money transaction between him and Choi. Lee, who is currently indicted on charges of fraud and embezzlement in a separate case, denied such allegations against him. On Wednesday, the prosecutors requested an arrest warrant for Choi on charges of fraud and habitual gambling. According to the prosecutors, Choi borrowed some 30 million won from baseball officials and his friends but didn't pay them back. The prosecutors, however, have yet to confirm whether he was involved in a match-fixing scheme. When media reports first began alleging illicit transactions between Choi and KBO clubs last year, the league office conducted its own investigation into the matter. At the time, the Heroes told the KBO that Choi approached them for cash but they did not give him any money.